In the second of two volumes on the Gospel of Luke, Darrell L. Bock offers students of the New Testament a substantive yet highly accessible commentary. With extensive research and thoughtful chapter-by-chapter exegesis, Bock leads readers through all aspects of the third Gospel--sociological, historical, and theological. The result is a guide that clearly and meaningfully brings the second part of this important New Testament book to life for contemporary readers. 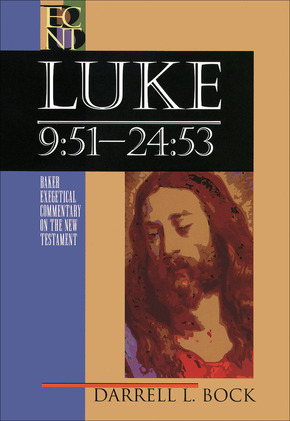 Bock's two volumes on the Gospel of Luke are the inaugural volumes of the acclaimed BECNT series. As with all BECNT volumes, Luke features the author's own translation of the Greek text and detailed interaction with the original text. This informative, balanced commentary also includes extensive introductory notes. It admirably achieves the dual aims of the series--academic sophistication with pastoral sensitivity and accessibility--making it a useful tool for students, professors, and pastors.